Rabbi Shapiro then contrasts two Shel Silverstein stories The Giving Tree and The Missing Piece to show how even a great author’s work bears reflection and screening. The second half of the volume weaves his clear-eyed parenting philosophy with specific stories from a variety of traditions, as well as of his own construction, that he recommends as holy and healthy. Each is brief and affords great opportunity for meaningful family discussion. I suspect that most readers of Matthew and Mark, and most readers of this Guide, are neither rabbis nor even Jews. And because I think this is true, I fear you may overlook some of the deeper insights Jesus meant to teach when he chose these two mitzvot as the chief commandments of the Torah and his touchstone texts. It is my wish to make plain the deeper meaning of his teaching by placing it in the Jewish context in which it was spoken by Jesus and heard by his fellow Jews, and in this way enhance your understanding of Jesus’ message. …does not mean, “I shall not desire,” but rather, “I shall not lack.” The Hebrew verb echsar (Lack) is in the future tense, suggesting that freedom from want comes only when you realize that God is your shepherd. Why? Because it is then that you realize your desires, endless and endlessly satisfied, are a distraction seducing you from your true calling and trapping you in the narrow and lifeless worship of the next big thing. With God as your shepherd, the chains of idolatry are severed. You are now free to be what God is calling you to be: a source of blessing and liberation for the world…..you will have everything you need to fulfill God’s desire-that you will have everything you need to become a blessing to others by liberating yourself and them from narrowness. David…is not saying that God acts for self-aggrandizement, but that God acts on behalf of all reality, for God is all reality….A path is righteous if walking it breathes life into life, if it blesses and benefits creation, and if it fosters love, justice and compassion. In the Rabbi Rami Guide to Forgiveness, the term takes on an expanded meaning grounded in the author’s training in Buddhism, life experience and psychology. Pratityasamutpada is “co-origination. It means that everything is connected to everything else and happens altogether.” Although he doesn’t cite it, those who study Kabbalah recognize the related teaching of the Hebrew term for stone, ehven. “If a soul is like a ben (ven), son/child, cleaved from the av (ehv), father/parent…can you picture that God would separate a part from God’s essence?” No, I can’t. Can you? This is why the Budda’s conceptualization rings helpful on this topic. Deftly wielding the language of living at the level of soul, Rabbi Rami doesn’t have us wait for others to confess how they’ve hurt us. He shows us how to heal ourselves through specific questions that restore us to living in the moment. This approach to removing toxic encounter hangovers is useful, and in my opinion, sufficiently only as a complement to the Jewish practice of teshuvah. Teshuvah, in brief, is where we return to those we’ve hurt, own up, are received with respectful listening and the necessary time is taken to process and restore relationships to good health. What do when teshuvah takes quite a long time? 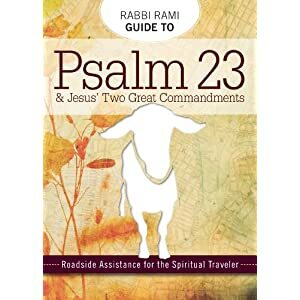 Rami’s volumes are subtitled “Roadside Assistance for the Spiritual Traveler,” let him show you the way.